Ask any mother or grandmother around what are the best gifts they have ever received. Their reply will most likely be those gifts that were homemade and from the heart. These kinds of gifts carry so much meaning and can be treasured throughout the years. If you are looking for a sweet and unique homemade gift idea, try making handprint art on any kind of ceramic dish. Preserving your child's handprint is a wonderful way to remind you and others just how small your kids use to be. What Kind of Paint to Use on Ceramic Dishes? You may be wondering what kind of paint to use on your ceramic dishes. I suggest choosing an enamel acrylic paint. This kind of paint is a little more expensive than your standard acrylic paint, but it is more durable and scratch resistant. You also can wash these dishes on the top shelf of your dishwasher once they are dried and cured in the oven. If you are planning on using these dishes around food, you need to make sure your ceramic paint states toxic-free and safe to use around food. Some ceramic paints contain harmful ingredients that should never be used near food. If you are hand painting a ceramic dish for home decor, you do not have to worry about the toxic-free label. 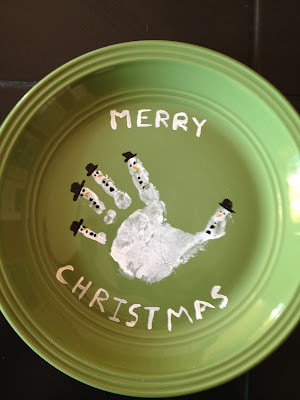 To get started making handprint art on a ceramic dish, you will first need to gather all the necessary supplies and decide what kind of dish you are going to paint. Be sure the dish has been thoroughly washed and dried. You also need to wipe it down with alcohol and a paper towel to remove any hidden residue. Before attempting to make the handprints, make sure to wash your child's hand. Dirt and oil from his or her hand could potentially affect the quality of the paint. Below are the supplies you will need and step-by-step directions for painting your ceramic platter. 1. Wash and dry ceramic dish. Wipe down dish with alcohol and a paper towel to remove any residue. 2. After washing your child's hand, use paintbrush to cover the hand completely with white ceramic paint. 3. Press child's hand firmly down on the platter. The gloss on the ceramic platter makes it slippery but try to keep the hand from moving. 4. If you want to start again: Quickly wash platter with warm water or use alcohol to help remove paint. 5. Paint hats, eyes, buttons with black paint and an orange nose. 6. Write title with Permanent marker. I used white acrylic paint because I wanted the letters to stand out on the green plate. 7. Once satisfied with the design, set platter on baking pan. Place in oven and bake for 30 minutes on 300 degrees. Do NOT preheat the oven. Let the platter gradually warm with the oven to prevent cracking or shattering. 8. Carefully take the pan out of the oven and set aside in a safe area to allow the platter to completely cool.